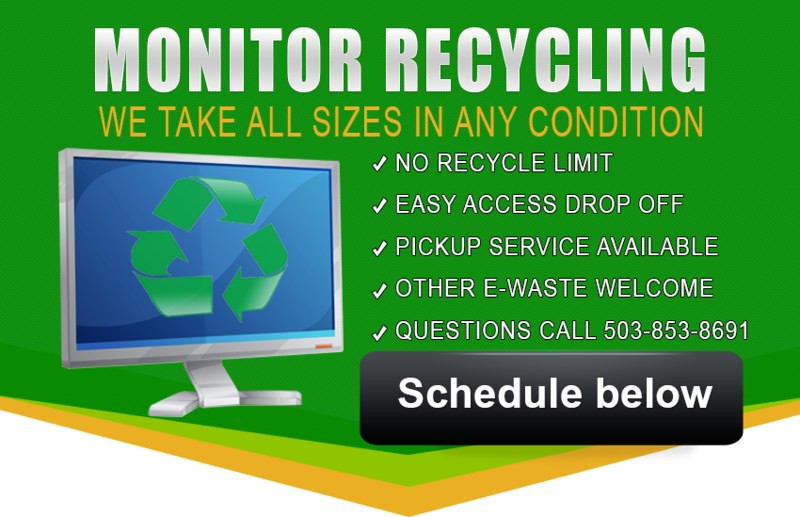 Use the form below to request Monitor recycling services. How many laptop hard drives do you have for Data Destruction? Has the hard drives been removed? How many Computer hard drives do you have for Data Destruction? How many Server hard drives do you have for Data Destruction? How much Digital Medial do you have for Data Destruction? How many Other Items do you have for Data Destruction? * Always free to drop off. ** For less than 20 hard drives the data destruction would be done offsite at our location, you are welcome to witness the data destruction process. Upon completion we provide a certificate to authenticate the process. *** Specific 2 hour window is not always guaranteed due to workload, traffic and weather conditions. We are a full service electronics recycler and collector specializing in all types of electronics waste (e-waste). We offer same day pickup service in the Portland-Vancouver Metropolitan area. Pickups are often free of charge and can be done at your convenience. We currently collect a few thousands pounds of electronics per month and we have the capacity to process large corporate e-waste pickups with a very short notice, in most cases we can offer same day recycling pickup service if you schedule early in the day. If you need quick response please use the form above or call us directly at 503 853 8691 to discuss your recycling needs.